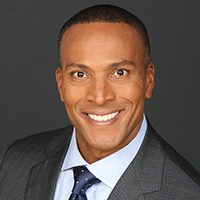 Mike Woods joined FOX 5 NY in June 2001 as the weekend meteorologist and "Good Day New York" feature reporter. He became the morning meteorologist for "Good Day" in October 2003. Mike has covered many major weather events in the Tri-State area, including blizzards, Nor' Easters, hurricanes and heat waves. Most recently, he spent nearly 72 hours on-air covering Hurricane Irene. Mike is originally from Sacramento, Calif., but has lived in a variety of different cities around the country since 1993. His first job on the air was in Eastern North Carolina, where he worked as the morning and noon weather anchor from 1993 to 1996. While in North Carolina, he covered several hurricanes, including Bertha and Fran in 1996. Before heading to New York, Mike provided the arid forecasts in the deserts of Phoenix from 1996 to 2001. Mike holds a degree in Rhetoric and Communications, with an emphasis on atmospheric science, from U.C. Davis. An AMS seal holder, Mike has received an Emmy nomination for best weather forecast by the NATAS and in 2009, McDonald's presented him with the Black Media Legends award. Mike's charitable works includes a cause that's very near to his heart – cancer. Recently, he raised over $10,000 for Leukemia and Lymphoma Society through the program, Team in Training, which is dedicated to training runners, walkers, triathletes, cyclists and hikers for events to raise money for cancer patients and their loved ones. Mike is also a Patron for the Ailes Apprentice Program, which is a diversity program that assists students and young professionals interested in pursuing a career in broadcasting and journalism. Mike is an active member and supporter of 100 Black Men Inc of New York and its Eagle Academy, The Ronald McDonald House, Housing Works, AYUDA for the Arts and Big Brothers Big Sisters. An accomplished triathlete, Mike enjoys working out, skiing and any activity involving physical fitness. He has been featured in Muscle and Fitness magazine in the "Real People" column.